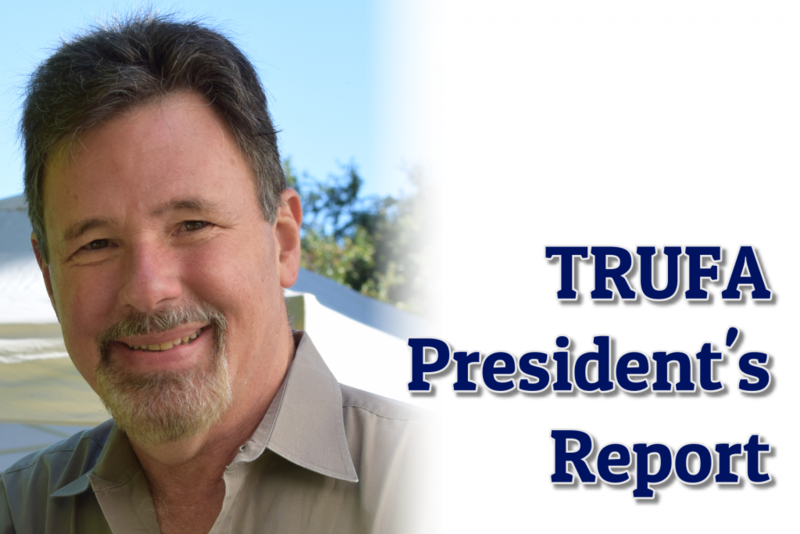 Since my last report in mid-October, here are some highlights of issues with which TRUFA has been dealing and activities I have undertaken on behalf of the TRUFA membership. As you may be aware, the Canadian Association of University Teachers (CAUT) has initiated an investigation of possible violations of academic freedom at Thompson Rivers University. TRUFA’s goal is to keep you fully informed to the extent that is possible given the circumstances of cases that affect our workplace and working conditions. TRUFA is actively providing representation for Dr. Derek Pyne, including taking appropriate actions under the Collective Agreement in response to his suspension by the University. Media reports about this case are not completely accurate. As such, we want to assure you that we are working on our member’s behalf. It is important to remember, though, that TRUFA does not publicly comment on active cases due to privacy concerns. TRUFA is affiliated with CAUT through its membership in The Federation of Post-Secondary Educators of BC (FPSE) and supports the CAUT investigation subject to the union’s own internal rules and the member’s preferences. TRUFA unequivocally supports its members’ rights to academic freedom. Academic freedom is essential to teaching, research and professional service, and TRUFA continues to defend members’ academic freedom whenever necessary. TRU administration has announced that new software—QUALTRICS—has been adopted for course evaluations. Results will be far easier for faculty to access through one.tru.ca and faculty can use new search capabilities so as to prepare for tenure/promotion application uses. The information will be accessible starting in January 2019. In an effort to ensure that tenure-track faculty are not burdened by administrative service that might potentially take away a necessary focus on successful tenure review, TRUFA will no longer grant waivers for non-tenured faculty to take on these elected departmental leadership positions. TRUFA and TRU administration have agreed to review the current training provided for elected members of departmental appointments committees. A concern raised by TRUFA is to ensure that there is adequate training in recognizing conflict of interest and bias, and in being away of the need for promoting equity in hiring practices. A number of Sessional faculty approached TRUFA indicating that they were often not paid until the 2ndor 3rdpay period after starting their contracts. TRU administration claims that Sessional faculty have to complete the paperwork required to put them on payroll once their contracts are signed. If you are a Sessional member and experience delays, please notify TRUFA. TRU administration committed to appointing an Associate Dean to provide academic oversight/leadership for the Williams Lake campus. 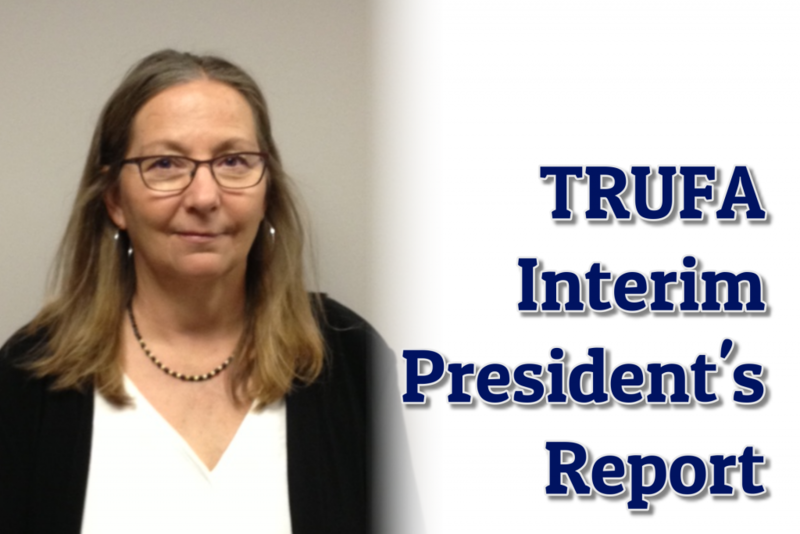 After a “failed search” in the spring, TRU is waiting to re-post the permanent position, and it is expected will appoint an interim Associate Dean in the near future. Academic programs at Williams Lake and its region fall under the authority of Kamloops-based departments; however, academic decisions about enrolment of students, exam schedules, etc. should, in TRUFA’s view, be made by an academic administrator working with WL faculty. Article 12.1.3.1 indicates that this period consists of “non-working days with pay.” The reality is that the vast majority—if not all—faculty members use this time period to prepare for the start of active duties at the beginning of the Winter semester. In certain cases, due to program needs, some faculty are assigned duties during this period—AHT, Library, ESL etc. Please let TRUFA know whether you or your colleagues are affected. TRUFA is working on ways in which continuing sessional faculty can avoid being taken off benefit coverage at the end of each semester’s contract and then being required to re-apply at the start of the next semester’s contract. TRUFA believes that coverage should continue seamlessly. If you are experiencing this situation, please notify TRUFA. The October 17thsocial held in the Panorama Room of IB was very successful. About 15 new faculty participated along with a number of TRUFA Executive members plus members of SWCC and Stewards. TRUFA will also be participating in the January new faculty orientation organized by the CELT group. We distributed the TRUFA Faculty Handbooks to all participants, and I found it very important to meet new faculty and to provide them with some important information about TRUFA and the unionized academic environment. I attended the annual conference of all western Canadian university faculty associations from October 18thto 20th, held this year in Athabasca, Alberta. With a couple of exceptions, all university faculty associations from western Canada were in attendance, along with the BCITFSA VP and FPSE president George Davison. The prime focus of the whole conference was highlighting the shift from “association” status to “union” status for all Alberta university faculty associations. Under the new legislation, all Alberta FAs are, for the first time, covered under the Labour Code, which gives them the right to strike and takes away binding arbitration as a dispute resolution provision. Here are the highlights of the conference. Trevor Zimmerman (Alberta Union of Provincial Employees). Staff organizer. Political action. Stephen Rader (UNBC) The New HR: liberal interpretation of emergency articles as the foundation for an illiberal approach to faculty relations. Observations from the U of Northern BC. Nick Driedger (AUFA). The new terminology in HR. Example of SAP, one of the largest HR firms in the world. Sylvain Rheault (URFA). Opening positions in Bargaining: the U. of Regina example. Kristan McLeod(Chivers Carpenter Law Firm). Along with 18 other FPSE faculty association presidents, I attended the legislative lobby on October 23rdto 25th. The presidents met with Minister of Labour, Harry Bains, to discuss recommended changes to the BC Labour Relations Code, and with Premier John Horgan and Minister of Advanced Education, Melanie Mark, to discuss post-secondary issues, including indigenizing the academy and precarious academic labour. In addition, FPSE hosted MLAs at an evening reception, to which both BC Liberal and NDP MLAs attended, and a luncheon for all government MLAs. I can report that the current provincial government is very receptive to hearing from post-secondary educators and understands the importance of addressing faculty concerns, not only as a way of strengthening the quality of college and university education, but also as a way of enhancing the economic and social development of our province. I met separately with Cariboo-Chilcotin MLA Donna Barnett to lobby on behalf of our Williams Lake colleagues, their programs and their students. Ms Barnett understands how important it is to have ongoing, permanent faculty positions in Williams Lake and was disturbed to hear that 75% of our WL faculty are non-tenured. In addition, she knows that the continuation and expansion of Nursing programs are desperately needed by the WL community and region. The presidents of the 19 faculty association unions affiliated with the Federation of Post-Secondary Educators (FPSE) normally meet four times per year. Because all of our faculty associations are going into bargaining this year, the FPSE AGM approved additional meetings to help prepare for bargaining and address some other key issues. We held a legislative lobbying session last month in Victoria and met again this past week in Vancouver. In order to comply with the new regulations of the BC Societies Act, the Federation was required to revise its governance structure. The 19 association presidents plus the four elected FPSE Executive Officers now form the Board of Directors of the new FPSE Holding Society, which is in compliance with the Act. The holding society will, in accordance with its name, “hold” the assets of the Federation, which will still be governed by the membership as a whole, i.e. the members of each faculty association through FPSE’s Annual General Meetings held every May. At the FPSE AGMs, affiliated associations conduct weighted voting based on the number of faculty members who belong to their union. TRUFA is the second largest affiliate with 13 delegate votes, exceeded only by Kwantlen FA with 15 votes. The returns on investment have, in every time period, exceeded the benchmarks and have exceeded the most recent actuary’s assumed rate of return of 6.25% set in 2016, which dictates contribution rates. In other words, the Plan is healthy. It’s likely that the next actuarial valuation for August 2018, which will be submitted next spring, will indicate that the Plan is funded at a rate high enough not to require increases to contribution rates. For your information, the pension contributions from employees and employers in all four public sector pension plans are invested by a BC crown corporation, the BC Investment Management Corporation (BCI), which charges a management fee of about 0.5%. That rate has increased slightly due to in-house management of private equity, real estate, infrastructure and renewable resource placements, but is substantially lower than the fees charged to any of us as individual investors. The total investments of the College Pension Plan alone are $5.032 billion as of June 30, 2018. I am arranging for one of our trustees to present an overview of the Plan for TRUFA members this coming March, focusing primarily on information that will be most relevant for early and mid-career faculty members. The Canadian Association of University Teachers (CAUT) Council meets twice a year—April and November—in Ottawa. The Council consists of delegates from more than 100 faculty associations representing nearly 80,00 college and university faculty members across Canada. The November meeting is scheduled for November 22ndthrough 25thand includes a Parliament Hill lobby during which faculty association presidents meet with MPs to highlight post-secondary education issues. This year’s lobby will focus on ensuring that changes to the Copyright Act achieve an appropriate balance between the rights of academics as producers of copyrightable materials and academics as users of those materials in the classroom. In addition to this national focus, I will be likely meeting with Cathy McLeod, the MP for Kamloops-Thompson-Cariboo, who is the co-chair of the Parliamentary Aboriginal Affairs Committee and will urge Cathy to support increased funding for Indigenous bands to allow more of their members to attend TRU and other institutions.